Ladybug crafts are inspired every year by the invasion of lady bugs. My daughter came up with this very creative way to encourage her 3 year old to participate in a sewing project. She explains it all here so you can also have a fun project with your small child. This spring the invasion triggered the ideas such as sewing ladybug bean bags. The bugs always seem to find their way through our screens and the windows every year. And this year we came up with something new to make in the kid's crafts to encourage my daughter to sew. Last year we drew the bugs, finger painted them, and learned to count them. This year I pulled out my sewing machine and decided sewing ladybug crafts would be fun for both my little girl and me. I didn't want her to miss out on the craft sewing part, so I made her a set of ladybug lacing cards for her. Lacing cards are great for preschoolers because it strengthens their fine motor skills. While Mommy sits at the sewing machine, my baby feels included with her own ladybug crafts. I made my own patterns for her to sew. 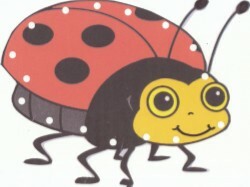 I scanned a ladybug picture with simple bold black lines and then printed it on stiff card stock. You can laminate your print before cutting it out to make it a little more durable. Once cut out, punch holes around the outside about every inch or so. You can use a plastic needle and yarn, or even a simple shoe or bootlace with the plastic on the end to substitute for needle and thread. Show your little one how to push the thread through the holes and remember it will take time and patience for them to catch on. While she was sewing her ladybug crafts I started mine. I saw a beanbag activity on my daughter's favorite television channel and decided to make it a "ladybug bean bag toss." This beanbag toss will help her develop gross motor skills. To make the beanbags cut some red heavy weight fabric into 7-inch by 7-inch squares, 2 panels for each bag you want. Your bags will last longer if you use a liner made of muslin to hold the beans. To make the muslin liner, cut 2 6-inch by 6-inch square panels for each beanbag. On the right side of the red fabric squares draw your ladybug dots with a black fabric marker. Once dots are dry place right sides together and sew. Allow about a ¼ inch seam allowance and sew 3 sides together leaving one side open. Sew the muslin panels the same way. Clip the corners of the bags and then turn right side out. Use a pencil to push the corners of the bags out. Pour about 2 cups of dried beans into the muslin liner bag. Fold ½ inch of the bag into itself and sew shut. Slip this bag into the red bag. Again, fold ½ inch of open side of the red bag down into itself and sew shut. I used black thread for added "ladybug" contrast. Continue sewing all the way around the bag about a ¼ inch away from the edge. Now for the best part of these ladybug crafts. Show your youngster how to play the game. You can have them start out by throwing the bags into baskets. Once they are comfortable and hardly ever missing, then switch to pots. As their aim gets really good, get 2 pieces of foam core poster board. Draw and paint the body of a ladybug on one of the boards. Cut out three of the black dots to toss the bags through. Lay the finished board on top of the second board. Tape top edges together to create a hinge. To secure the boards and keep the from splaying a part knot a cord and thread through holes poked through the left and right sides of the front and back boards. Knot it to secure it. Repeat it on the opposite side. 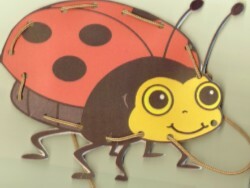 Now your ready for everyday indoor, outdoor fun with your ladybug craft!